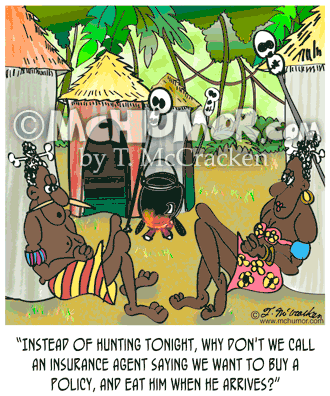 Insurance Cartoon 5292: Cannibal to another, "Instead of hunting tonight, why don't we call an insurance agent saying we want to buy a policy, and eat him when he arrives?" 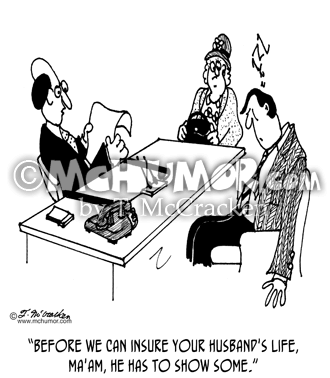 Insurance Cartoon 3315: A Japanese woman saying to her husband, "Should we get renter's insurance for the plant, dear?" 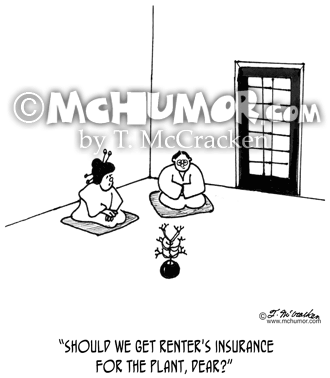 All they have in the living room is one plant, and no furniture. 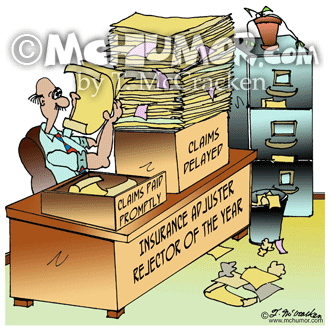 Insurance Cartoon 8361: A man with a plaque, "Insurance Adjuster Rejector of the Year" has two boxes on his desk: Claims Delayed and Claims Paid Promptly. 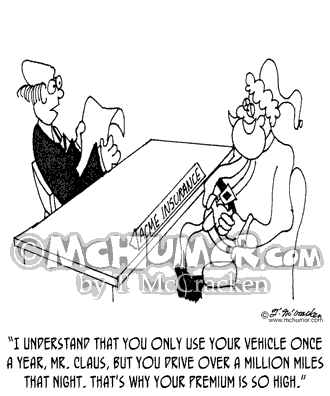 The first has an over flowing stack of paper in it, the other a single sheet of paper. 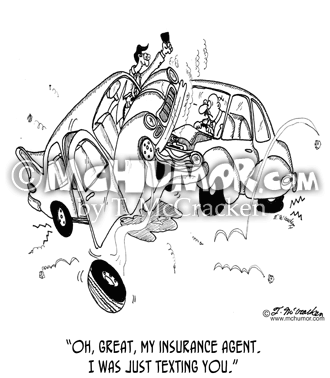 Accident Cartoon 5640: A man who's crashed his car into another says, "Oh, great, my insurance agent. 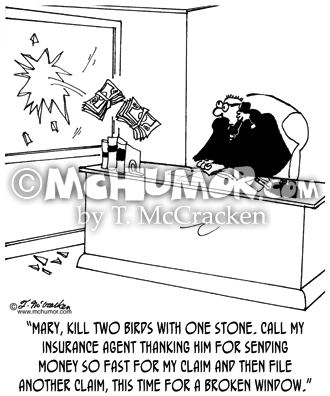 I was just texting you." 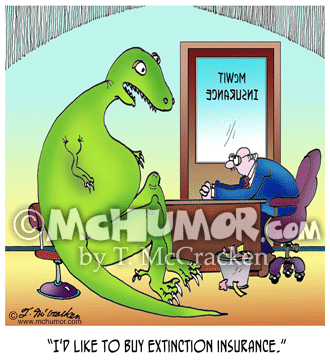 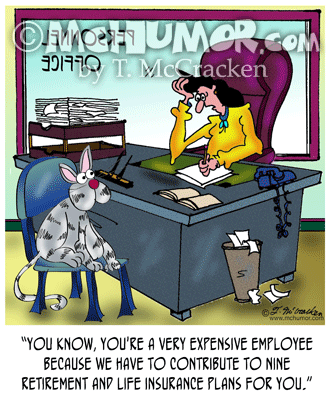 Insurance Cartoon 5156: "The most bizarre life form Gyork had ever encountered." 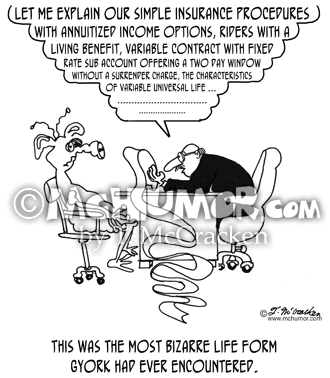 An insurance agent says to a confused space alien, "Let me explain our simple insurance procedures with annuitized income options, riders with a living benefit, variable contract with fixed rate sub account offering a two day window without a surrender charge, the characteristics of variable universal life ... "